An attempt to find out the IWW's actual involvement in the Seattle General Strike of 1919, which has been hampered by myths caused by the capitalist press and AFL union leaders of the time. The Seattle General Strike is an event very important in the history of the Pacific Northwest. On February 6, 1919 Seattle workers became the first workers in United States history to participate in an official general strike. Many people know little, if anything, about the strike, however. Perhaps the momentousness of the event is lost in the fact that the strike took place without violence, or perhaps it is because there was no apparent visible change in the city following the event. But the strike is a landmark for the U.S. labor movement, and is very important, if for no there reason, for what it stands for. Workers expressed their power through a massive action of solidarity, and demonstrated to the nation the potential power of organized labor. This was at a time when labor was generally divided over ideological lines that prevented them from achieving such mass action very often. For many at the time, however, the strike represented something else: something more sinister and extreme. To many of the locals in Seattle the strike was the beginning of an attempted revolution by the Industrial Workers of the World and others with similar radical tendencies. These people saw the putting down of the strike was the triumph of patriotism in the face of radicalism gone too far. The insistence of these conservatives that the IWW was behind the strike, together with the state of the organization and its place in the labor movement at the time, has created a mystery as to just how much of a role the "Wobblies" played in the Seattle General Strike. Looking into this seemingly simple question brings about many other questions that were hard to answer in 1919, and remain even harder to answer now, eighty years after the fact. How did an ordinary conflict between shipyard workers and owners turn into an event the magnitude of a general strike? How many of those in control of the strike were involved with the IWW, or sympathized with their cause? To what extent did the strike's leaders attitude correlate with those of Seattle's rank-and-file workers? In the end, it is hard to imagine how the Wobblies could have brought about the general strike as many accused them of doing at the time. Historians have suggested that the strike was organized by the AFL unions in Seattle, and that the IWW did not play any significant role. This is the general position offered by those within the strikes internal leadership of AFL union officers. The truth as to the IWW's place in the general strike most likely lies somewhere between the paranoia-filled sentiments of conservatives, and the claims of these AFL leaders who spent years claiming the IWW possessed no influence or involvement. A deeper understanding of this must begin with some background on the labor movements history in Seattle, and the IWW's place in it. In the late nineteenth century, the Pacific Northwest came of age. Gold was discovered in Alaska, the lumber industry flourished, the Northern Pacific Railroad was completed, Washington achieved statehood, and Seattle was put on the map. The waters of Puget Sound first made Seattle a key port for the transportation of timber in the 1880’s and 1890’s, and soon after a first stop for miners on their way to Alaska hoping to strike it rich. Seattle and the entire region developed a unique culture, a way of life all its own. Part of this culture was a radicalism within the labor movement that surpassed that of the movement elsewhere. Many Northwest workers were migratory, especially those in the unstable, inconsistent lumber industry. Industry organizations were formed in part for the purpose of combating organized labor, keeping wages low and working conditions cheap. Into this arena stepped the Industrial Workers of The World, formed with the goal of developing class-consciousness among workers and organizing them into "One Big Union." 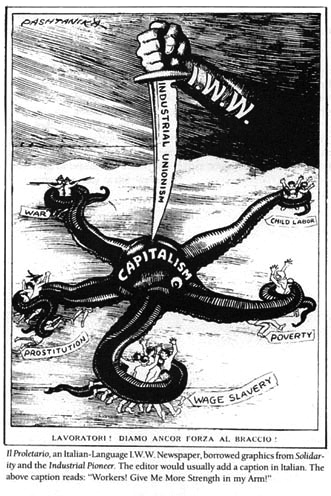 The frontier economies of the West provided the IWW with many workers who would listen to the IWW’s ideas with open ears and open minds in the early 20th century. For about the first fifteen years of the century, the IWW developed and maintained a very strong presence not only in the Northwest, but also in other regions throughout the United States. Utilizing tactics such as free-speech fights and demonstrations, IWW members toured the Northwest preaching their ideals and attempting to establish themselves in various communities. During the years before World War I, the IWW also came to be feared and hated by some segments of society. The ideas they espoused were contrary to the American ideals of freedom and capitalism. In his book, Rebels Of The Woods, Robert L. Tyler described the opposition that the Wobblies came up against. "That Jeffersonian myth at the heart of this post-frontier society was actually threatened much more by the railroad boom and the beginning of large-scale capitalist exploitation of the region’s resources than by the I.W.W. rhetoric. But the I.W.W. appeared, almost providentially it would seem, as scapegoats." In towns like Everett and Spokane, the fight against the IWW got violent. In 1909 a free speech fight in Spokane resulted in many arrests and raids on the IWW hall, while in 1916 IWW members clashed with opponents in Everett. The violence in Everett left people on both sides dead and wounded. This episode was just one incident where the resistance to the presence of the Wobblies in a community turned violent. By 1919 the IWW was considered by many to be a radical and dangerous organization that was working toward the goal of sparking a revolution. The Russian Revolution by the Bolsheviks in 1917 deepened the fears of conservative Americans and created a red scare throughout the country. By praising the events in Russia the IWW soon came to be associated with the revolution. A conservative Seattle man named Edgar Lloyd Hampton wrote an article in the Saturday Evening Post two months after the general strike in which he blamed the IWW and other radicals for what happened. Hampton claimed, "The I.W.W. themselves openly boast that the Russian Revolution was planned in the office of a Seattle lawyer, counsel for the organization..." This sentiment, which was quite common among people outside labor movement circles, perpetuated the idea that an event like a general strike was really an attempted revolution. While people may have exaggerated the involvement of the IWW in the Seattle General Strike, the history of the Wobblies in the months and years leading up to the strike did provide their opponents with ammunition and evidence to support their claims. IWW members never shied away from confrontations with their opponents, and made their radical ideas well known. In August 1918 the IWW was reported to be plotting a general strike of miners and lumber workers throughout the West. 32 Wobblies were arrested in Spokane in connection with the plot. Scores of Wobblies were arrested following the passing of anti-sedition laws by the government. The same month that the plot was broken up in Spokane, 70 IWW members were jailed in Seattle for "government investigation as suspected seditionists." There were also reports of a mass meeting in Tacoma of the Tacoma Soldiers’, Sailors’, and Workmens’ Council where the speakers, including I.W.W. representatives, urged "a peaceful overthrow of the present form of government in the United States and the taking over of government industries by the working class..."
An article in the Oregonian on January 13, 1919 reported on a meeting of "Bolsheviks" in Seattle at 4th and Virginia at which speakers were urging a general strike in large part to prevent the shipping of supplies to Siberia for use by armies who were resisting the Bolsheviks there. These articles all reflect the fact that there was an abundance of activity by the IWW and other radicals in the years prior to the strike. The activities that found their way onto the pages of the newspapers made much of the public resentful, distrustful, and afraid of the Wobblies and their intentions. An interview of Frank L. Curtis some years after the strike shows how some assumed the IWW was directly behind the strike. He told of how his father, a conservative Seattleite, believed revolution was at hand, and admitted these beliefs were fostered by "I.W.W. trouble" in previous years rather than the facts of the case in early 1919. He described how the "great wonder after the strike was over how good respectable working people had followed the lead of the I.W.W... no one could understand how the I.W.W.’s had put it over." While these sentiments were exaggerated beliefs that stemmed from conservative fears and misunderstandings, there is historical evidence that suggests that there were Wobblies and other radicals who were more involved than most secondary sources claim. Spy reports indicate that they participated in various ways, including attendance at meetings, distribution of literature, and various speeches addressing the strike issues. One report claimed that IWW members were meeting with strike leaders in Seattle and Tacoma. Reports also indicated the circulation of IWW materials at Central Labor Council meetings and the pasting of IWW propaganda at the vote by soldiers and sailors to support the general strike on January 28th. One report even suggested that the President of the State Federation of Labor telegraphed AFL international officers claiming the strike movement was being organized by the IWW and AFL leaders who were IWW sympathizers. This report also claimed that he had requested help to control the situation and prevent the IWW from taking control of the labor movement from the AFL in Seattle. These reports suggest that the IWW was playing a role in the campaign for the general strike, and that the Wobblies possessed considerable influence in the Seattle labor scene. Another spy report describes an IWW meeting that took place on January 1st 1919, when labor leaders in Seattle were considering a general strike. A speech by Walker Smith, a well-known Wobbly in Seattle, was reported on, and while he was quoted as praising the IWW and encouraging his listeners to support a general strike, there was no indication from his words that the IWW was leading the strike at all. Smith’s words reflect the IWW’s strong belief in the necessity of general strikes, and he pointed to the events in Russia, saying, "Look at Russia! When the Working Men, the Soldiers, and the Sailors organized as a mass, they put an end to human slavery and capitalism. The workers can do that everywhere if they want to." Another reason that many were so inclined to accuse the IWW was the connection people had in their minds between the IWW and large-scale actions like general strikes. The general strike as a strategic action was an important weapon in the IWW’s arsenal, even though they never really used it. The shutting down of all industries was an important step towards achieving the kind of economic system desired by the Wobblies. Their literature, however, did not endorse using force to achieve their goals. Rather, the IWW saw direct action resulting from class-consciousness as the necessary groundwork for a general strike. The general strike as an ideal represented the kind of solidarity among working people that the Wobblies wanted to see in the United States. This acceptance of the idea of a general strike was in part what led to all of the fingers that were pointed at the IWW when the Seattle General Strike came about in 1919. One article, in listing the IWW’s methods and principles, mentioned general strikes, saying the organization’s methods included "the habitual use of the strike - particularly the general strike - not much to remedy the specific grievances or to establish improvement of labor conditions as to cripple and ruin employers and paralyze the industries of the country." Sentiments like this reveal the association that many people made between the idea of a general strike and the perceived revolutionary radicalism of the IWW. While the use of a general strike was something talked about more by the Wobblies than other contemporary unions, it was not something out of the realm of possibility for the AFL craft unions. Large scale actions and sympathy strikes were prevalent in the history of the labor movement, and would continue to take place in future years. General strikes came later in other U.S. cities, including San Francisco. In the case of Seattle, the various unions came together in solidarity, crossing the lines of craft unionism which previously had made large strikes relatively rare. A Union Record article that appeared late in January before the strike had occurred told of how the Central Labor Council was debating over whether the general strike should be a sympathy strike or a mass strike. This question was never really officially answered. In fact, the inability to declare any clear goals for the strike was another reason why people found it easy to speculate that the IWW was behind it. Furthermore, if a general strike was going to happen anywhere in the U.S., Seattle was arguably the city where it could take place most easily. The environment of Seattle, far distanced from other regions, together with the unique radicalism that characterized the entire labor movement in Seattle, made the city a likely testing ground for a general strike. The working class in Seattle was firmly grounded in its progressive, radical ideas. In his book on the Seattle General Strike, Robert Friedheim emphasizes the radical sentiments of Seattle unions, citing the national AFL’s view that the local unions of Seattle were dangerously radical. Friedheim quotes The Rebel Worker as saying the labor movement in Seattle was "so distinctive that even the IWW characterized it as a movement ‘affiliated - more in form than in spirit - with the American Federation of Labor.’"
In the opinions of the conservatives and middle class people of Seattle, the radicalism of Seattle’s unions had become much more dangerous and fevered. In his article on the strike, Hampton pointed to the Union Record as a sign that the labor movement was getting more extreme. He wrote that the Union Record had turned "from a more or less radical weekly into a much more radical daily." He also claimed that the Union Record had urged workers to support a general strike even though most unions did not want to do so. Hampton, like many other citizens of Seattle, firmly believed that the general strike was an attempted revolution, engineered by the IWW and other "Bolsheviks" in the hopes that it would spread to other cities and states. As the IWW fell deeper into a state of defense against the onslaught of opposition and persecution, individual Wobblies, as well as the organization as a whole, were forced to alter their ways. Before 1919 it had become common for most Wobblies in Seattle to be members of other unions, which was due to both the danger inherent with publicly spreading the IWW’s ideas, as well as the difficulty that came in trying to get a job without joining the AFL-affiliated craft unions. As one worker put it, "’... I belong to the I.W.W. for a principle and to the A.F. of L. for a job.’" This system of dual membership was referred to as "boring" and the existence of such a practice provides further mystery by raising the question of just how many workers and leaders within AFL unions believed in the principles and ideals put forth by the IWW. The answer, once again, lies somewhere between what a conservative would claim (that the IWW controlled the AFL unions during the strike) and what the actual leaders of the strike would say (that the Wobblies had no presence). One labor leader who spoke about the strike frequently in the years following it was James A. Duncan, who was Secretary of the Seattle Central Labor Council at the time of the strike and a longtime respected leader in the Seattle labor scene. Duncan later testified in a court case that the General Strike in Seattle was not directly led by any radicals or IWW’s. When asked to explain his opinion as to the cause of the strike, Duncan explained that those in Seattle’s labor circles believed that labor’s opponents were working with the government to destroy the movement, and that this process was beginning with the shipyard workers, whose conflict quickly developed into the general strike. Duncan expressed also in his testimony that he doubted there were more than three percent of the Seattle Central Labor Council who were party socialists. Although Duncan was very adamant about playing down the influence of radicals in the strike, he probably stretched the truth to some degree. The leaders within the Central Labor Council had reason to distance themselves from groups like the IWW. Openly allying themselves with these elements would certainly fuel the fires of conservatives who already were fearful of a possible revolution clouded by the general strike. It is interesting to compare Duncan’s testimony in the later court case to a quote attributed to him in the Union Record just days before the strike, in which he exclaimed, "It is all right to talk about the revolution, but some of us are not revolutionaries." While this quote does indicate that Duncan was not himself a revolutionary, it also may lead one to believe that there were others involved who were, and that addressing the desires of the more radical element in Seattle labor was an issue for the leaders. The desire to downplay involvement of the radicals and IWW’s was also evident in a pamphlet issued by the General Strike Committee after the strike ended. In addition to detailing the events leading up to and taking place during the strike, the pamphlet also addressed the widespread ideas that it was anything more than a sympathy strike by the AFL. In it the committee claimed that the strike was carried out by unions of the AFL, acting on the decisions made by the voting rank-and-file. They also plainly denied that the IWW had any part, "contrary to sentiments made widely throughout the country." Addressing accusations that the leaders of the strike were revolutionaries, the committee wrote that, "Probably hardly any of the so-called ‘leaders,’ accused by the press of trying to start Bolshevism in America, believed that the revolution was at hand. Such belief as there was occurred in isolated cases in the rank and file..."
The strike committee claimed that the IWW’s rumored leading role came from two things, primarily. First, the press’s desire to discredit the strikers. Newspapers did nothing to stop the spread of panic in the days before, during, and after the strike. In fact, the press helped perpetuate people’s fears. An example is an article in the Seattle Star in which the paper appealed to peoples’ "Americanism" to stand up to the revolutionary hopes of the Bolsheviks who were attempting the strike. Secondly, the publication and distribution of "dodgers" during the strike. Many people saw the Wobblies handing out their literature and believed it was official strike propaganda. Indeed, the IWW was visible on the streets during the strike, but this was certainly nothing new, and the assumption that this now meant more than before was unfounded. Most of the historical evidence connected with the labor community about the strike denies the IWW played a key role. An article with Henry M. White, who worked as a mediator during the strike, said in a letter written to the Union Record that in his negotiations he had not recognized any of the labor representatives he dealt with as being connected to the IWW. He also wrote, "I would certainly not brand the unions of Seattle as being influenced by the IWW with nothing more substantial than mere rumors to justify it." In an interview with Robert Friedheim, Ed Weston, a member of the Boilmakers’ Union in Seattle during 1919, said that the strike was not sponsored by the IWW, that Wobblies had no important positions if leadership in the strike, and that their influence was "probably nil." He also said that Seattle Mayor Ole Hanson falsely accused many labor reps of being "reds." Indeed, Ole Hanson is one major contributor to the idea that the General Strike was a revolutionary attempt to overthrow the government. Following the end of the strike, Hanson toured the country telling his story of the strike, which was that he had thwarted a revolution by radicals. Already suffering from a major backlash and red scare, the IWW’s reputation was further damaged by Hanson’s claims. An article appeared in one publication after the strike praising Hanson and supporting the idea that he had suppressed a revolution attempt. The article claimed that the secret service had provided the police with information from IWW meetings that the IWW was behind the general strike. Knowing this, the article claimed, allowed Mayor Hanson and the police to stop the strike quickly and prevent a revolution. Hanson is quoted in the article as saying, "Bolshevism in Seattle is dead. No other city need fear them if the methods we employed are used." Hanson called also for the removal of the IWW from places of power in labor unions, greater control over immigration into the U.S. of "aliens" who brought radical ideals, and the passage of more laws outlawing the IWW and other radical organizations that were anti-government. In the wake of the strike, IWW members saw the persecution against them intensified. Thirty-nine Wobblies were arrested in connection with the strike as the authorities tried to place blame for what had happened on the radical elements of Seattle’s labor circles. The headquarters for the IWW was raided. The false blame put on the Wobblies was met by another unique display of solidarity among Seattle’s labor movement, as the Central Labor Council came to the arrested IWW members’ defense to defend "fundamental rights involved in these cases which are necessary to our own existence." In an era when the IWW and AFL were separated by their ideological differences and the opposing approaches of class unionism and industrial unionism, Seattle’s labor movement once again showed their solidarity. On a sadder note, the IWW faced one of the darkest chapters in its history later in 1919 when an Armistice Day parade in Centralia, Washington turned into a bloody conflict between members of the American Legion and the local Wobblies who were trying to maintain their presence in the community. There were deaths on both sides, including an especially harsh and brutal lynching of one Wobbly. The IWW had seen the peak of its influence, and was now spiraling downward in the face of so much opposition. IWW leaders had hoped that the strike would stand as a demonstration of the inherent power of worker solidarity and spark a wider acceptance of IWW ideals over those of the AFL. Instead, the labor movement headed into a different direction that stood in between the two segments ideologically. While Hanson, conservative citizens, and many press outlets maintained and spread their belief that the Seattle General Strike had been an attempted revolution, the IWW as an organization did not claim any direct participation or leadership. New Solidarity, a national IWW newspaper out of Chicago, declared that the IWW as an organization or as individuals was not behind the strike. The paper did, however, support the strike and expressed admiration for those who participated in it. On February 22, the paper published an "Ode to Seattle," which praised Seattle for showing what labor could do by acting in solidarity. New Solidarity explained the strike’s origins in the shipyard strike and listed some of the lessons learned from the weaknesses and strengths they saw. The IWW had always supported the idea of a general strike because it was the best way to cause the complete paralysis of an industry. In Seattle, the AFL craft unions had finally crossed the lines and come together as a working class. Hopefully, to the IWW, the events in Seattle would be repeated later on a larger scale. In analyzing the causes of the general strike the IWW pointed to the persecution of its members in Seattle, which led to a situation where many workers were members of both the IWW and another craft union for their job. Another factor recognized by the Wobblies was the social revolution that had taken place in Russia and influenced many in America. The IWW is a compelling subject to study, both as an organization and in cases like the Seattle General Strike, as individuals. In assessing the organization’s role in the strike, what is most important is specific individuals who may have been Wobblies or accepted their ideas. Seattle was unique for the radical nature of its labor unions, and the IWW was right in the middle of the scene. But in the General Strike, the IWW stayed largely in the background, watching and hoping it would lead to something more that they had dedicated their lives to fighting for. The strike also came just as the IWW was going into serious decline, largely from the persecution by the same people who accused them of being behind the strike.